It seems like a lot of blue, purple, and oranges in Italy. All the clothes and fits are amazing. I’m jealous. what is going on with his shoulders? are the ruched? He looks very well put together. I think the cuffs on his pant legs add a nice twist to a well tailored suit. The beautiful shoes tie the whole look together. The tie knot is “fat” is a result of the width of the tie itself. A well dressed guy! As for me i’d rather wear black shoes and lower the trousers. The overall slim fit is a must! There is an exhibition of the history of street photography on at Tate Modern in London at the moment. I was wandering around it today and thought you would be fascinated by it given your current pursuits. Everything from Brassai at night in Paris to documentary evidence from New York, 1880 to 1970. I know you don’t get to London much, but it may well tour. And it’s on until the end of August. 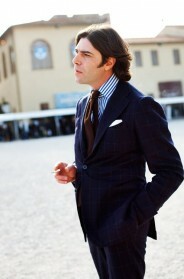 Particularly loving the men.style.com postings at the moment. If you ever make a book of your favourite photos, can I ask that you do a separate mens and womens one? If you did I’d buy one for me and several as presents. Love LOVE the suit (and the shoes). This is the perfect color blue, and it is becoming more readily utilized in clothing I have seen. It’s obviously not a “business suit blue”, but to me, this begins to challenge the traditional color palette menswear is accustomed to and changes it just enough. Scott- is that a roped shoulder I see, or just the way he was holding himself? J’adore! He is uber-fantastic. I love the contrast of the shoes against the suit. And the trouser length is perfection. Great shade of blue. I like the high collar and the bold stripes on the shirt. Looks like there’s too much roping at the jacket’s shoulders. Maybe it is just the way he is standing, but the shoulders don’t look right to me. It’s particularly jarring because Italian suits are famous for softer shoulders, and this seems to be quite the opposite. I like the brown shoes with the blue suit, but not the black socks. I like it but can someone explain the brown shoes and black socks with this blue suit? I don’t think it looks that out of place but it’s not the first thing I would’ve thought of. God, I love those pants. Beautiful. So much blue, but it works. Love the short, narrow pant leg, and the shoes. Not loving the haircut so much, however. Oh nooooooooooooooo, that hair is all wrong. Everything else is right. He’s showing enough cuff and pocket square. The pants I prefer to break a tiny bit farther but that’s just me. The hair the hair! WOW, killer roped shoulders. This is the way to do shorter length on pant, with trim cut. Tie a bit wide therefore a bigger knot. He’s got the goods for a Florentine sartorialist. Great shoes. the shoulder roping seems over the top on that jacket. is it just the way his arms are folded? otherwise it’s a nice, natural, and stylish outfit. i really like the patch pockets and tall collar. pants strangely tapered and too short. And the visible black socks not good either. I realize the right shoulder is bunched up but still, that’s some serious roping. I love his smile and the look in his eyes. Those two things, for me, make him all the more charming. Agree with comment on shoes. Not the color but something somewhat ‘lighter’ might have been better. I just discovered your blog. I have to look through your archives. I recently moved to Rome from L.A. One of the many things I love about this city is seeing men like Mr. Ricci. ha. His outfit is perfect. Love the hair. lovely color suit, lovely smile. the chunky shoes work with the deep trouser cuff. i like the way he keeps everything else simple. wow. Does anyone make a beautiful off the rack suit for women? or are women just screwed and have to resort to getting something made to measure…. maybe women are just too many different shapes to get it right off the rack? I would never have thought of electric blue as a good color for a man’s suit, but it works on this guy at least. He looks perfectly comfortable and unself-conscious in it (could an American pull this off?). You picked the perfectly colored wall as a background too–the light yellow goes well with the blue. He could use that as a shirt color for this suit next time he wears it. Love the color and fit of the suit, especially the slim, high water, wide cuff pants. The shoulder tailoring looks a little sloppy, unusual for an Italian. The shoes could be a little darker and a little slimmer. But so what? 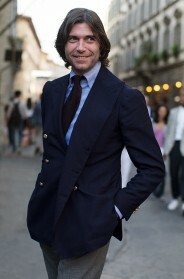 If I looked like Nacho Figueras’ kid brother, I’d be grinning too! 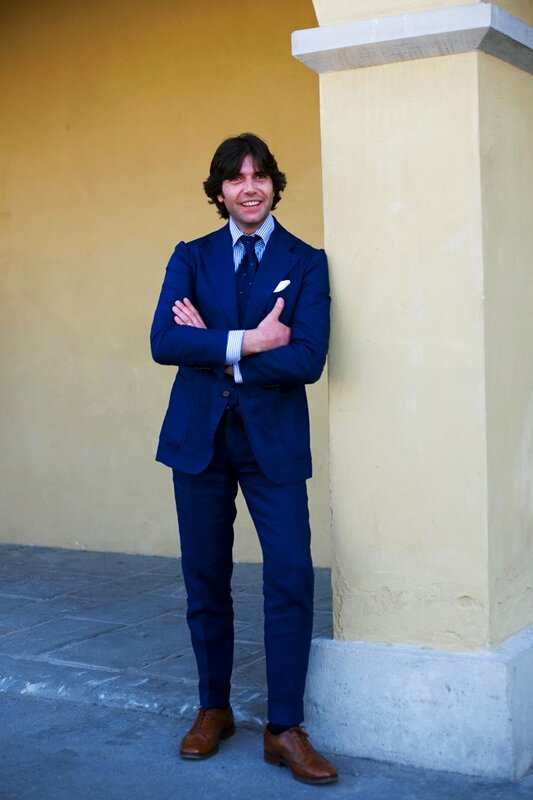 I’m totally feeling the ease and effortless flow of Mr. Ricci’s style: He looks absolutely put together and yet never contrived (unlike a certain individual in a similar blue silhouette with the croc manbag…). Everything from his hairstyle to his stance gives such an air of genuine relaxed elegance. Thank you for sharing Sart! Wow….I think he looks terrible (At least in the context of this site). I hate the length of the pants as well as the tapering (which is fairly pronounced given that this gentlemen does not appear to be a whispy model). I also dont like the shoulders – and I dont care what they say about the construction of the suit. Ahhhhhhh…I am drooling over this man. All I can do is look at the trouser cuffs. And his hair. And his warm brown eyes. Italian men… ;) Yes, I want to move to Florence. Whenever I’m there I sneak pictures of the men. They collect in deliriously well-dressed groups outside shops and on the street during lunch. They really do! It’s like a mecca for sartorialist man-watching. another gorgeous guy in a great suit! love evrything about this look apart from that odd shoulder thingy..? may be forced to go live in italy at this rate! the shoulder is his signature. he is a tailor. Very nice suit indeed! The fit also perfect! The suit reminds me of what Romeo Gigli used to make, what Mr. Gigli doing now? love the suit. the color is gorgeous! love everything about it. it’s a bit off beat. but I appreciate it being that way. It looks like International Klein Blue! I I love the roped shoulders. I have never ever seen any shoulder like that on a man’s suit!!! But it works very well. I can see and feel that this man really owns his look and his suit. Great example of a man’s clothes reflecting his personality/overall style aesthetic. The shoes are a bit too flat and don’t really finish the line of the pants well but are still beautiful. honestly can’t find a thing wrong with it, he embodies florence! divine.